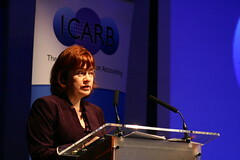 Sarah Boyack MSP, opened the conference with a review of how far the Scottish Government has come since ICARB first started in 2007, through the first national carbon budget and the clear commitments to achieve stringent emissions reductions targets over time. Professor Sue Roaf then introduced the agenda in the following presentation. Before being elected Sarah was for several years co-ordinator for Labour’s environmental policy in Scotland. She is currently also a member of Labour’s Scottish Policy forum. 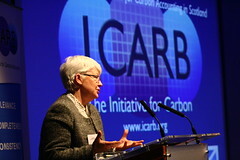 In November 2004 she received the RSPB Goldcrest Award for the greatest contribution to the development of environmental policy since devolution and in December 2005 was named Scottish Renewables Best Politician. Visit Sarah Boyack’s professional website. She is best known as a designer for her Oxford Ecohouse which was the first UK building with an integrated photovoltaic roof. She is an award winning designer, teacher and author and is Co-Chair of TIA, the international Teachers in Architecture organisation and Co-Chair of the Westminster Carbon Counting Group. She has also chaired a number of International Conferences including the 2nd International Conference on Solar Cities in 2006, the 1994, 2001, 2004, 2006 and 2008 Windsor Conferences on Thermal Comfort (with Fergus Nicol), and the 1995, 1998, 2000, 2002 and 2008 TIA conference on Architectural Education (with Marco Sala). This entry was posted in Top Presentations on May 6, 2013 by Ric.